Clementine came in today and let us snap some pictures of her conch piercing I did a while back. It turned out great and looks awesome on her. 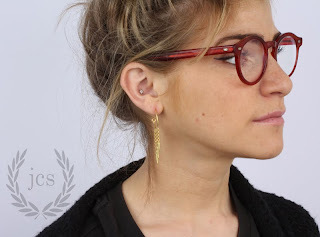 She is wearing a 5mm flower: diamond (in) diamond (out) set in 18k yellow gold. The piece below is a similar style with different stones. 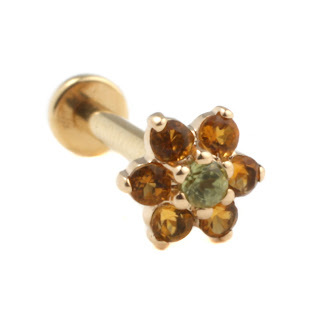 Its a 7mm flower: citrine (out) peridot (in) set in 18k yellow gold. Its available at Brooklyn Adorned. The flower is beautiful! I'm dying to buy one for myself... do you have a link to a store? I checked NY Adorned (the link you listed under jewelry) but couldn't find it. Hey lilly, our stock always changes so its hard to keep it updated on the web. If you email me at jcolbysmith@gmail.com i can get one to you. fyi you can do any stone combination you like, set in either rose, white or yellow gold. do you know how much would a piece like this cost?